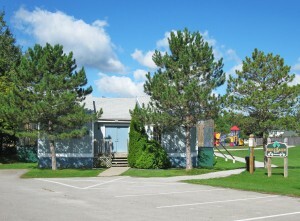 The Fonthill Platform Tennis Club has two Courts and a Clubhouse located at the west end of the Pelham Arena Parking Lot at 1120 Haist Street in Fonthill. There is a Town of Pelham Playground and Swing Set just behind our courts in Rolling Meadows Park. To contact the Club, phone (905) 892-8942 and leave a message with your contact information or email the Club at fonthillplatformtennis@gmail.com. A Club Board Member will get back to you as soon as possible. FPTC stands for Fonthill Platform Tennis Club which is located at 1120 Haist St. in Fonthill, Ontario. For over 44 years the Club has provided healthy access to the unique sport of Platform Tennis, a racquet sport that is played outdoors in the fall, winter and spring. Individual and Family Memberships are available. This current season, we have over 90 members including several new members in each League. Members ranging in age from 21 to over 70 are playing in leagues scheduled in the daytime and evenings Monday through Friday. Several unofficial ‘pickup leagues’ still keep our courts busy during unscheduled periods. As we have all come to realize, playing Platform Tennis is a great form of exercise and a good way to socialize during the cooler nights of fall and winter. It is rewarding to spend time in the fresh air away from the couch … and amazing to realize just what our bodies can tolerate. To date, we have had several social “Scrambles” where we all have the opportunity of enjoying even more “Paddle”, food and camaraderie. The next Scramble is the Men’s Kaos … to be held on Saturday January 14th, 2017. The following is a list of the official Club Leagues for the 2016-2017 Season. Note: Starting and Ending times are approximate. Monday Evening – the women’s evening recreational league plays on court 2 from 6:30 p.m. until 8:30 p.m.
Monday Evening – the men’s evening recreational league plays on court 1 from 6:30 until 9:30 and on both courts from 8:30 p.m. until 9:30 p.m.
Tuesday Evening – the women’s competitive league plays from 6:00 p.m.until 9:00 p.m.
Wednesday Evening – the recreational mixed league plays from 6:45 p.m. until 9:15 p.m.
Thursday – the women’s morning recreational league plays from 8:45 a.m. until 11:30 a.m.
Friday Evening – the mixed social league plays from 6:00 p.m.until 10:00 p.m.